Julia Ioffe, who profiled Melania Trump in a generally positive light, is inundated with anti-Semitic threats. 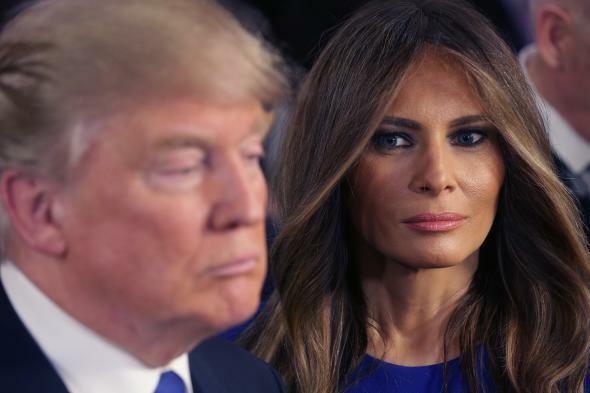 Donald and Melania Trump in Detroit in March. On Wednesday, GQ published a long profile of Melania Trump, possible future first lady of the United States, by Julia Ioffe. Ioffe is a contributing writer for the New York Times Magazine (and an occasional Slate contributor) who was born in Moscow and writes frequently on international politics, which made her an excellent choice to profile Donald Trump’s Slovenian-born wife. Ioffe is also Jewish, which is irrelevant—or would be irrelevant if not for a group of violently abusive Trump supporters who have been inundating Ioffe with threats since her profile was published. Ioffe’s piece is an impressively reported portrait of a woman who has stayed mostly out of the spotlight (to the extent that that’s possible when you’re married to Donald Trump). In addition to interviewing the model born Melanija Knavs, Ioffe talked to a few of her high-school classmates, a former roommate, a stylist and photographers who’ve worked with her, her father’s neighbor—and her half-brother Denis, whose existence has never been reported before. * Ioffe discovered that Melania’s father, Viktor, initially denied that Denis was his son, then fought a court order to pay child support for him, and finally paid up but never made contact with Denis. The incident paints Viktor as a morally dubious character, but it’s a small part of a thorough, fair longform article that generally depicts Melania in a positive light. It is, of course, Melania’s prerogative to dislike having her personal and family history shared with the world. And Ioffe understands that, telling CBS News that even though “her husband is running for president—she is now a public person,” Ioffe is “sorry if it caused discomfort for her and her family.” If we lived in a sane world, we could just chalk this up to the eternal conflict between public figures looking to control their images and journalists looking to break stories, and leave it at that. But we don’t live in a sane world. We live in a world where Donald Trump is about to clinch the Republican nomination for president. And so hateful Trump supporters began to harass Ioffe on social media, sending her a slew of sickeningly violent anti-Semitic images and messages, along with the usual barrage of misogynistic threats. In addition to the cartoons of lampshades labeled “Good Jews,” Ioffe began receiving ominous phone calls instigated by trolls, including a call purportedly from a casket service and another inquiring about “homicide clean up.” Ioffe’s Twitter feed is a marvel of stoicism and good humor about the threats, but she also understandably called the police (who, sadly, have a pretty terrible track record when it comes to protecting women from anonymous threats). The fact that female journalists face harassment and abuse on social media just for doing their jobs isn’t new. The virulently anti-Semitic nature of the threats against Ioffe are legitimately shocking, however. Ioffe told the Guardian that before now, she’s only seen anti-Semitic messages like this in Russia—which her family fled for that precise reason. Donald Trump is not personally responsible for the abuse that Ioffe has had to endure this week. But it’s not a stretch to conclude that his candidacy, laced with not-so-subtle xenophobia, has emboldened the most hateful and frightening corners of the internet. Trump could make a statement clarifying that he doesn’t condone any form of anti-Semitism and imploring his supporters not to abuse Ioffe (or anyone else) on the internet. Would that make a difference? Maybe. We’ll probably never know. Correction, April 29, 2016: This post originally misspelled Melanija Knavs, Melania Trump’s birth name.